Our mission is to exceed client expectations by providing the highest quality product possible in a timely manner. We endeavor to create and maintain long-lasting, prosperous relationships with our client partners. 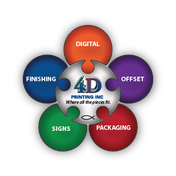 Established in 1985, 4D Printing, Inc. is a recognized leader in providing commercial printing solutions to customers in any market. Well known for our high standards and professionalism, we are moving forward with an aggressive determination to master the challenges presented in an industry of changing technology.